A piping run exists from 2 pumps and combines into a common header (Figure 1). Can FEATools help in reduce the force on the nozzles at nodes 120 and 570, Pump A and Pump B respectfully? The largest forces to the nozzles are FX=1140 lb on node 120, and FX=3626 lb force on node 570. Would utilizing FEA Tools in the CAESAR II Analysis help? Specifically, would it make sense to apply ASME 07-02 to this model through FEATools? If FEATools is used to refine the SIF and flexibilities to new factors at the Tee, would this result in reduced loading at the pump nozzles as seen in CAESAR II? Here are the baseline global element forces for pump A and B prior to using FEATools (Table 1). A baseline of global element forces for pump A and B after using FEATools is described in Table 2. Figure 1 – Pumps run to common header. Obviously, the minimal reduction in forces does not warrant the use of FEATools unless the stresses are approaching the stress allowables. It is important to first understand what type of conversion is happening here so that we can better understand our results. The updated SIF’s and flexibilities are coming from ASME 07-02, recommended changes to Appendix D of the B31 codes. It has been known that a number of the SIF’s from Appendix D are incorrect and give incomplete guidance. In addition, the omission of k-factors for branch connections allows for ASME 07-02 to correct these errors. Figure 2 below describes the added restraints and springs that are inserted at the branch connection per the guidelines in 07-02 by FEATools. Each branch is connected by a series of connecting nodes to the center point of the tee, set with k factors from the allowables in ASME 07-02. 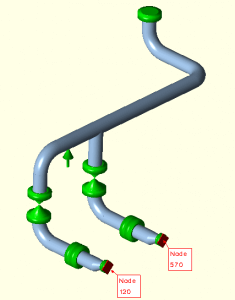 The added spring connections have the potential to reduce stress caused by thermal strain in a given piping system. This type of model fidelity is best applied when other solutions have not been successful or are not ideal in a CAESAR II analysis, such as adding expansion joints or expansion loops. In this case, an analyst could conclude that FEATools would not reduce the load significantly enough to make that much difference in the overall equipment loads. Therefore, if we are going to reduce the loads on the pump nozzles, one must explore other options.